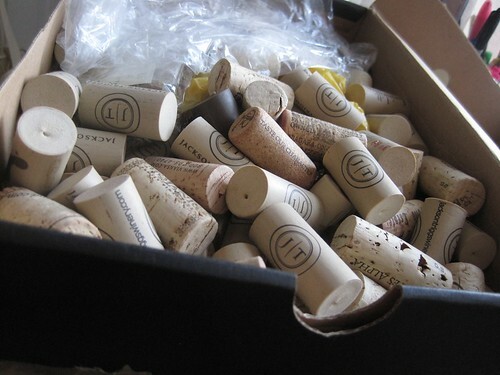 (Some of these may well still be among those sent to me from a friendly blog reader who wanted to help me out by re-housing her cork stash to me. Thanks, Melissa!) Now, I’m not making any promises as to how many more little corks will soon find themselves wearing knitted hats and sweaters. 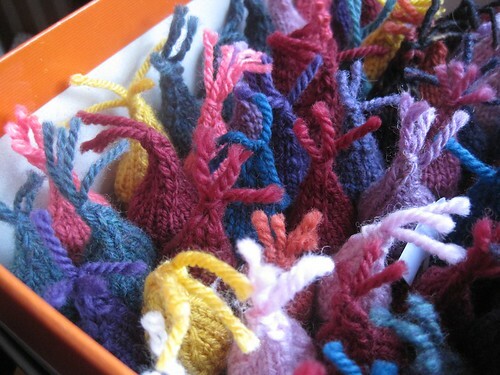 But it’s coming up on wacky holiday season, and a girl needs a little distraction every so often, and one of these takes maybe half an hour if you’re quick, and I’ve got worsted-weight scraps in my leftovers stash that are just waiting to be put into action. 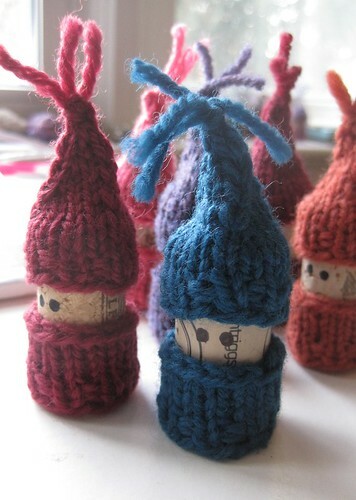 I’d love to make a bunch of those and glue little books to them – a chorus of carolers! Oh, no…… I’m fresh out of corks! Guess I’ll have to go buy some wine, which should also help me de-stress, right? Thanks for sharing this ! Hurrah for korknisser! I love that you have a whole village of them in hibernation. Now off to find some wine that doesn’t come in a screw-top bottle. I had completely forgotten about that pattern! But now I’m going to have to make me some…..Yay! I saw a paper roll version to make these little guys a few weeks ago and went back looking through your old posts to find them. I was wondering what you had done with them. Too funny to find this post today! My cats LOVE these things. I find dismembered korknisse all over the house. These are adorable! We save our corks for shibori already. I love having a new idea for old corks. Thank you! Oh those little guys are so cute . . . but how do you know which ones are girls? Wow. So cute! I am going to make some. I have many multiple corks that would do the job. I don’t have a problem, really……. I have a cat who likes to hunt these too !! Adorable. AND — I just opened a bottle of wine, right before settling in to blogsville. Now, of course, I’ll need to finish the bottle tonight since the cork is most definitely spoken for. How cute, I love finding uses for things people would normally throw out. This has got to be the funniest knitting post I’ve seen in a while. To embrace the whimsy of it all! By the way, I’ve been quite intrigued by your twisted moss-stitch fingerless gloves. Been making a test one and bought yarn for a visiting gift coming up in February. Thanks so much! Adorable! And even better, something I might actually be able to accomplish before Christmas. Thank you! Wow! They are sooo adorable! I wish I had some corks! So cute! How many of those do you have? From the looks of it, you have quite a few!